Details of the Match Fixtures for the UEFA Youth League are confirmed. 11,249 all-seated Aker Stadion has a synthetic pitch and is the venue for the U19s UEFA Youth League 2nd leg. It’s the domestic venue for Molde FK first team who compete in top Division of Norwegian football Eliteserien. Molde FK have also hosted Champions League at Aker Stadion. 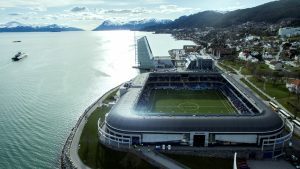 Molde II, the club’s reserve team that compete in the Third Division also play at Aker and the normal domestic league venue for their U19s. The Stadium is right in the centre of town, situated in a beautiful location by the fjord. Molde has an Airport, Molde Arø (MOL). Nearby Alesund Vigra (AES) or Kristiansund (KSU) also might suit UCD Fans travelling to or from Oslo or other Norwegian cities by air. Bergen (BGU) also has many International destinations. [Kristiansund is north of Molde and not the larger town Kristiansand close to Oslo]. Molde doesn’t have a train station, but Åndalsnes (33km) is the nearest station. OSL 10:50 Outward 17th Oct SAS €60.70 (8kg carry only) 70.70 (23kg checked). RET 19th/20th OCT SAS €236/€248. SAS via Copenhagen €189. After these dates, the price decreases. MOL 20:40 DY 17th Oct €109 (carry on) €134 (20kg checked). AES 20:05 17th Oct DUB -OSL - AES 1 -way €124.92 (8kg Hand). Train: Torp Lufthavn to Andalsnes (33km from Molde) minipris between 400kr and 600kr one way on www.nsb.no. Budget airline airport. No flights to/from MOL, AES, KSU. Flights in Norway to/ from Bergen (BGU), Trondheim (TRD). Int. Manchester (MAN), London Stansted (STN), Amsterdam (AMS), Hamburg (HAM) and Copenhagen (CPH) Also Poland and Spain. Air options: Using DUB with two flights to West Norway and two flights back. The price of the Oslo-Dublin leg on Thurs 19th and Fri 20th is prohibitive. The costs come down on Sat 21st and Sun 22nd. A good value air-only option price 17th Oct Norwegian DY 1363 Dublin – Oslo – Molde €109/€134 But a 5hr wait in Oslo. Return to Oslo Thursday 19th SAS 3 flights €97, €108/€127, €138. Return to Dublin sat or Sun. Or remain in west for another day or two. Two Fans have chosen Tuesday 17th DUB – OSL – AES (Alesund) €97/€110 and 1 night Alesund. Bus and boat to Molde using FRAMmr.no website. Spending a few days in West Norway before returning by train from nearest train station Åndalsnes to Oslo Lufthavn, airport stop. Train also goes to Oslo S, main Oslo Rail Station. Rutebok.no very good general website for varied transport in Norway available from point to point. (Bus, Train, Catamaran, Ferry even Planes mixed in with overland transport). Norwegian Railways sell discounted (eg OSLO Åndalsnes 299 krone each way). The services can include Catermaran or Ferry Services as the route crosses fjords. Eg Ålesund to Molde crosses Moldefjord from Vestnes to Molde. From the south, Vestnes is the corresponding port facing Molde. There is a second service from Molde to Sekken Island, low altitude (200 metres). Bikes can be rented in Molde to bring free on the ferry. Port to Port: Example Molde 21:30 – Bergen 14:30 (17 hours); Molde 22:15 Kriantiansund (KSU) 01:45 (3.½ hrs); Molde 22:15 – Trondheim 08:30 (10hr 15mins) Fares are with or without Cabins. Second part of information on Molde and Norway. Molde is in Møre og Romsdal county. Currency: €1 = 9.03kr NOK/Kroner. 1kr divided into 100 øre. Kviltorp Camping. Beside the convenient Molde Arø Airport. Tent spaces, Caravan and Motorhome spaces, Cabins (Hytter), Apartments (Leiligheter), Boathouses (Sjøhus). Scandic Seilet Hotel (prev. Rica Seilet Hotel) extraordinary hotel with glass sides jutting up like a sail. Right beside the Aker Stadion. bbNorway.com Bed and Breakfast Norway. (Molde is in Møre og Romsdal county). Malmestranda romutleie, Fræna Country side B&B 15 minute drive north of Molde. single 400kr, Double 650kr. AirBnB.com (Private 1- and 2-bedroom apartments advertised. Apts may or may not have residents also sharing the same apartment). Serviced and non-serviced Cabins (Hytter) and Mountain Huts are available to rent. Norway has only 5% cultivated land and with 4.5 million people has vast areas for Outdoor pursuits. “Right to roam” is an unwritten law that allows Norwegians and tourists to walk through the wilderness. It also allows to camp at the spot for one night provided the site is 150 metres from the nearest water or habitation. Walking routes and Cabins on detailed maps. As Molde is on a fjord there is steep high ground above the town. With plenty of opportunity for walking. Even on expected wet days of mid-October. Norwegians have become immune to tourists complaints regarding the cost of living in Norway. VisitNorway Official Tourism has a few recommendations for Tourists to try and cut costs but still enjoy their stay.